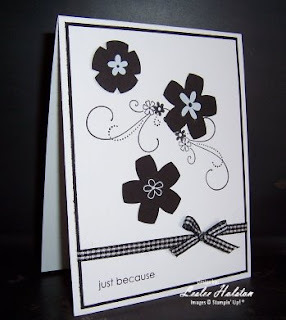 This was made for the Clean & Simple Challenge on Splitcoast Stampers (posted on Monday). You can check the challenge out here. As a matter of fact, anyone can play along and this challenge is a lot of fun. I was inspired by this adorable pair of shoes. Again (this is becoming habit), my flowers are 'double punched'. I, also, used rub-ons that I've been hoarding for awhile now. The card is pretty self explainatory. Of course, I used my fav. black & white gingham ribbon! Thanks for slowing down long enough to cruise my blog. Come back for a pit stop anytime! They say that slow and steady wins the race! !